Secondary Source #1: On April 22, 2003 I received the following e-mail from Joe O'Byrne. "Hello my name is Joe O'Byrne. I live in Beaubassin and my family has always lived here since 1672. I am writing about the refugee list you have published stating it was from 1732. What were these people refugees from in 1732 ?? 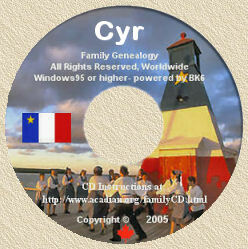 The refugee list is from 1751 and was compiled at Pointe Beaujesour. I have a photo copy of the original which is kept at the Colonial archives in Paris France." . Secondary Source #2: Microfilm C-2572 of the National Archives of Canada [Note: According to Stephen A. White, this in fact is the misfiled copy of the 1750/1751 Census.